Im just a neebie so still learning. I had an electric bike for about a year which was great to commute to uni but a friend gave it away to lifeline so I need a replacement. It was a 1kw hub motor kit and got me to uni in about 10 mins (6km) So averaging around 36km/h i think. I would like to build a skateboard to try and get a similar speed and travel time. From what ive been reading I would probably need a 12S setup. However, I came across this slimmer 10S battery and I would love to try use my cnc to build 2 or 3 of these batteries into the deck. I cant decide whether to go with the 190kv motor from enertion or the much cheaper Turnigy Aerodrive SK3 - 5065-236kv motor. I think the best option will be to go with a VESC from enertion too along with the motor pulley and belt. I think the gt2b controller sounds like the way to go however doesn’t seem to be easily available in Australia. I plan on just making my own deck or hacking up a cheap one and using my cnc to make the large pulley and motor bracket. My main question is if anyone can share some information on the best way to charge a 10S lipo. I really dont want to buy a crazy expensive charger so I’m guessing building my own would be the cheapest option. I know I could get two 5S lipos and connect them up in series to get 10S and then charge them in parallel with a cheaper charger but I would prefer to minimise wiring and like the idea of using 2 or 3 - 10S slim batteries in parallel. Could anyone point me in the right direction as to if it is possible to get a charger for such a setup on a budget (sub $100aud)? The 5065 will be very under powered, and I would never recommend a single motor that small: I think it’s something you’d regret down the rode. Also, I know people have CNC’d the wheel pulley, but has anyone done a motor pulley? My one recommendation is to make sure their is a ring around the edge of the motor pulley to keep the belt from becoming off centered. For the batteries and charging, you could always just go with two 6s packs in series to get your 12s voltage goal. 6s packs are easy to charge with any standard balance charger, and I’m sure you could find one for less than 100aud. GT2B from HobbyWarehouse in Australia and an IMAX B6AC V2 is around $110 AUD I believe. Where are you in Australia? This is the only thing Ive seen thats similar to a small pulley like would be used on the motor. Not worth the time to machine as they are so cheap anyway imo. I’ll stick with the R-Spec motor then. I know 2 x 10Ah 6S batteries in series would be the easiest option but Id love to use those skinny 10S batteries. but if its going to cost be $200 for a charger, I would be better off getting a space cell. Im in Brisbane and thanks, just wasn’t looking hard enough for the gt2b. You could always buy an R-Spec and then just add an enertion motor pulley to your cart. I’d have a keyway, and would definitely be the easiest option. Yeah ill just buy the motor pulley and belt through enertion. This seems a little sketchy but an interesting idea. What do you think? I only recommend doing this with a really out of balance pack. Way too tedious to do regularly. I dont really understand how you found that so quick. What is tedious about about it? Sorry if I ask basic questions, I still know nothing. I guess I am just spoiled. I use a bms with a dedicated charger. No setting or buttons, just plug it in and walk away. So is it possible to get a bms and wire it to a couple of those 10S lipos in parallel? You could set that up for 10s lipos but a nice benefit for lipos is the swap of lipos. If you end up using a BMS using 18650’s is a better idea. I think I might bite the bullet and just get a space cell. Is there any reason why I shouldn’t get these? 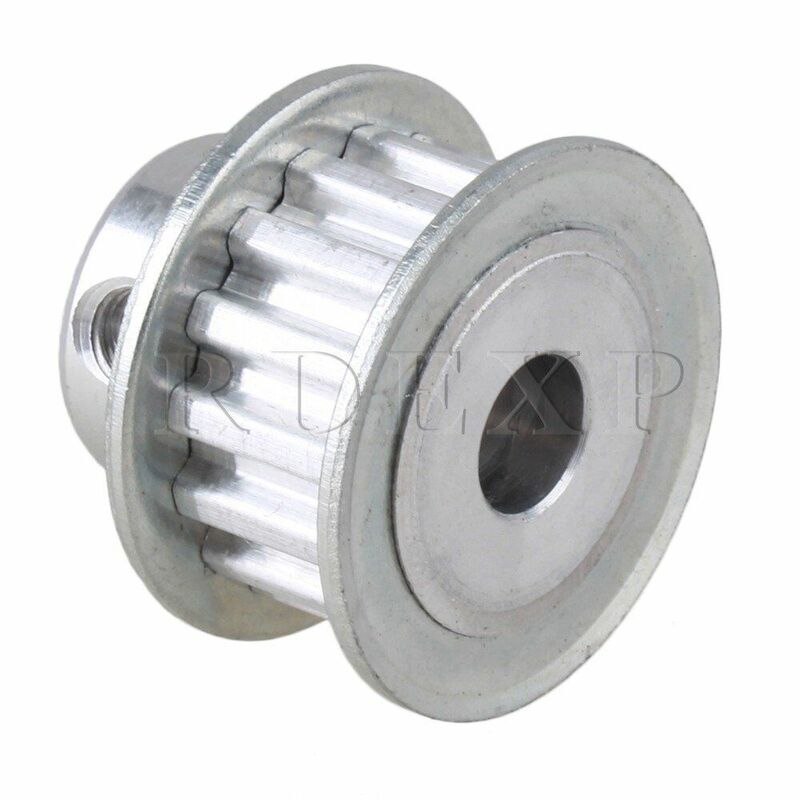 Sides With Ribs For Motor Schaft XL 8mm 15 Teeth Aluminum Timing Belt Pulley | Industrial, Material Handling, Other Material Handling Supply | eBay! Specification: Description: Widely used in the car, motorcycle, sander, sterilization machine, conveyor, dishwasher, drying machine, printing machine, packaging machinery, food machinery, mining equipment, ect. | eBay! You’d just have to make sure you’re wheel pulley has the XL profile. the XL belts do not have as much holding torque as the HTD belts, but they will work. especially if you put an idler or 2 in there.